2. Department of Radiology, Molecular Imaging Innovations Institute (MI3), Weill Cornell Medicine, 413 E 69th St, New York, NY, 10065. Biosafety is the primary concern in clinical translation of nanomedicine. As an intrinsic ingredient of human blood without immunogenicity and encouraged by its successful clinical application in Abraxane, albumin has been regarded as a promising material to produce nanoparticles for bioimaging and drug delivery. The strategies for synthesizing albumin-based nanoparticles could be generally categorized into five classes: template, nanocarrier, scaffold, stabilizer and albumin-polymer conjugate. This review introduces approaches utilizing albumin in the preparation of nanoparticles and thereby provides scientists with knowledge of goal-driven design on albumin-based nanomedicine. Keywords: Albumin, Nanoparticle, Drug delivery, Bioimaging, Theranostics, Multifunctional. Precise diagnosis and effective drug delivery have been attracting considerable interest in cancer therapy during the past decades [1, 2]. Nanoparticle-based systems have demonstrated promising potential for precise diagnosis and effective drug delivery by active and passive targeting or prolonged blood circulation time [3-7]. Discoveries of the potential side effects of nanocarrier materials have inspired scientists to explore biocompatible materials to construct nanoparticles [8-10]. Albumin, a component of the human blood, has been widely used as a clinical excipient in many formulations (Table 1). As evidenced by its successful application in Abraxane in clinical nanomedicine, albumin is one of the most attractive materials for the development of novel nanomedicine . Albumin offers several advantages that guarantee its success in Abraxane and in future developments in other types of nanomedicine: 1) Albumin is a component of human blood. It shows no immunogenicity as an endogenous protein (35-50 g/L human serum) and ensures its biocompatibility for albumin-based nanoparticles . 2) The half-life of albumin in human blood is approximately 19 days on average. Unlike free drugs, albumin presents a long half-life that helps improve the plasma area under curve (AUC) value, thereby maintaining a high blood drug concentration at a relatively long time [17-19]. 3) Albumin is an excellent lyoprotectant for the solid form of nanomedicine and allows immediate redispersion of dried nanoparticles in injectable solutions . This advantage favours the development of shelf-stable nanomedicine by avoiding drug release and precipitate formation, which are general problems in the development of clinical translatable nanomedicine. Albumin is distributed all over the body via blood flow, which has been utilized to determine the total blood and plasma volume in the Jeanatope and Megatope (Table 1). In optimizing nanosystems, albumin requires further modification and fabrication to obtain precise diagnosis and effective drug delivery in vivo . Various medical needs need the expansion of albumin applications in different nanosystems . In addition, the development of multifunctional nanosystems demands the integration of different functions into single nanoplatforms [11, 23]. These unprecedented requirements are totally different from those of current albumin-based clinical drugs. Thus, scientists have been motivated to design new nanosystems with albumin for the past two decades. There are generally two types of albumin used in constructing nanoparticles: human serum albumin (HSA) and bovine serum albumin (BSA). Both kinds of albumin are serum albumin proteins (from human serum and cow serum, respectively) and share a lot of properties, including high solubility in water, long half-life in blood, similar molecular weight (65-70 kDa), similar number of amino acid residues (585 amino acids for HSA and 583 amino acids for BSA) [18, 24]. There are no observable differences of properties in constructing nanomedicine. Thus, both kinds of albumin have been widely used in designing multifunctional nanoparticles. The developed technologies with alternative albumin could be easily replaced. Thus, the introduction including both kinds of albumin will give a thorough summary and clear route on the developing technologies of albumin-based nanomedicine. There have been many excellent reviews on albumin-based nanomedicine from different aspects, including preparation technologies, hybrid albumin nanomedicine, half-life extension, bioconjugate chemistry, theranostic applications [12, 18, 19, 24-27]. These reviews have given clear summaries on albumin-based nanomedicine and prompted the quick development of the technologies in this field, however, none of them focused on the roles of albumin in constructing multifunctional nanoparticles. The unique multi-properties of albumin give different opportunities to construct multifunctional nanoparticles with expected properties. In this review, we summarize the different strategies with albumin as different roles for constructing albumin-based nanosystems aimed at different applications and thereby aid researchers in their study of this field through reasonably designed nanomaterials (Figure 1). Several reports have presented the synthesis of inorganic nanoparticles with the presence of thiols, such as glutathione [31-33]. Many free thiols exist in albumin due to the presence of cysteine-34 free thiol groups . Thus, albumin has been explored as a template to synthesize fluorescent metal clusters and inorganic nanocrystals [35-38]. The process is regarded similar to the biomineralization occurring in natural organisms, that is, the thiol groups sequester and interact with metal ions and provide scaffolds for the formation of nanoparticles (Figure 2). The free thiol groups in albumin could coordinate with metal ions and entrap them. The reduction ability of albumin molecules could be activated at a pH of ~12. Alkaline pH plays a key role in the formation of clusters [40, 41]. At a neutral pH, each albumin molecule traps 13-14 Au(III) ions. When the pH increases above 12, these bound Au(III) ions are reduced to Au (0). Furthermore, the nucleation and growth of gold nanoclusters commences, and the fluorescence emission property appears. Albumin helps reduce the intracellular production of reactive oxygen species (ROS) and improves the stability of albumin-templated gold nanoclusters against ROS in living cells [42, 43]. The fluorescence emission of the formed nanocluster could be tuned from blue to NIR with varied reaction conditions [44, 45]. The wide tunable emission wavelength makes it suitable for various bioimaging applications, including cell imaging and in vivo fluorescence imaging . Albumin serves as the template in the synthesis process and facilitates the post-synthesized surface modifications with functional ligands. Thus, other contrast agents and drugs could be modified on the surface of the albumin-templated clusters for multimodal imaging and theranostics [47-49]. With the protection of albumin, the gold nanocluster shows stable fluorescence properties against a pH range of 3-12, HEPES buffer and solution with a high salt concentration. The prepared nanocluster solution could be lyophilized for storage and redispersed with an aqueous solution. This advantage facilitates the fabrication of shelf-stable multifunctional agents in the form of dry powder with the fluorescence clusters. The advantages of the extra stability inspires scientists to explore its applications in biomedical applications, including probing pathogenic bacteria selectively  and monitoring local pH values inside cells . Moreover, the albumin-templated gold nanocluster shows considerably longer lifetime (> 1 ms) than that of organic fluorophores (1-5 ns) and autofluorescence (~7 ns) . The long lifetime of albumin-templated gold nanocluster was used to stain cells and imaged 50 ns post excitation, which could separate the signal from the autofluorescence of the cell. This type of time-gated imaging discarded all detected photons from the autofluorescence and improves the signal/background ratio in fluorescence imaging. a) Scheme of synthesizing albumin-based nanoparticles with different strategies and the biomedical applications of the prepared nanoparticles. Parts of the figure adapted with permissions from [30, 39]. a) Scheme of synthesizing highly red fluorescent gold nanoclusters. b) Scheme of synthesizing near-infrared fluorescent Ag2S quantum dots with the presence of albumin as the template and its conjugation with anti-VEGF mAb. c) Scheme of synthesizing Gd:CuS@BSA hybrid theranostic agents. Figures (a) and (c) adapted with permissions from [28, 39]. The penetration depth of external light excitation-induced PL restricts the application of albumin-templated gold nanocluster. Therefore, albumin was conjugated with beta-emitting isotopes Fluorine-18 (F-18) and Yttrium-90 (Y-90) . The Cerenkov radiation produced during radioisotope decay could transfer its short wavelength energy (250-550 nm) to the gold nanocluster to provide a near-infrared (NIR) wavelength emission. The designed nanostructure eliminated the restriction of tissue attenuation in the external light irradiation and improved the penetration ability of the emitted light by transforming it into a transparent biological window. Metal clusters could emit at a NIR wavelength range (650-900 nm), which is regarded as the transparent biological window . The drawback of the limited penetration depth of optical imaging restricts its clinical applications. Thus, hybrid multimodal imaging nanoprobes have been intensely studied to provide complementary information from each modality . Gao and his colleagues developed [64Cu]Cu nanocluster using albumin as a template for positron emission tomography (PET) imaging in an orthotopic lung cancer model; this model utilized PET's advantage of unlimited tissue penetration, high sensitivity and high temporal resolution . Albumin was pre-conjugated with a tumor-targeted peptide, luteinizing hormone releasing hormone (LHRH), and then; subsequently, the [64Cu]Cu nanoclusters formed through albumin-templated metal cluster synthesis. The prepared [64Cu]Cu nanoclusters showed rapid tumor targeting, which benefited quick imaging in future clinical translation. The rapid renal clearance from the mice was useful in quickly clearing radiotracers. However, this result slightly differed from those of other reports because healthy mice should not excrete albumin. In addition, the emission of the synthesized nanocluster showed an emission peak at ~410 nm, which was not favourable for non-invasive in vivo fluorescence imaging [46, 57]. Another group reported a multimodal nanoprobe that combined the complementary advantages of NIR fluorescence, X-ray computed tomography (CT) and magnetic resonance imaging (MRI) . The triple-modal nanoprobe utilized the high sensitivity of NIR fluorescence and the high spatial resolution and excellent tissue penetration depth of X-CT and MRI. The integration of multiple components in a single nanostructure helps obtain complete information ranging from non-invasive whole body examinations to microscopic tissue examinations. Theranostic nanoparticles will play a significant role in personalized medicine . A luminescent gold nanocluster synthesized with albumin loaded the anticancer drug DOX at high efficiency . Biocompatible theranostic nanoparticle could be excited at NIR wavelength with a femtosecond laser pulse for two-photon fluorescent imaging, thereby satisfying the requirement for non-invasive in vivo imaging. Furthermore, the anticancer drug DOX could be released from the nanoparticle to kill cancer cells. 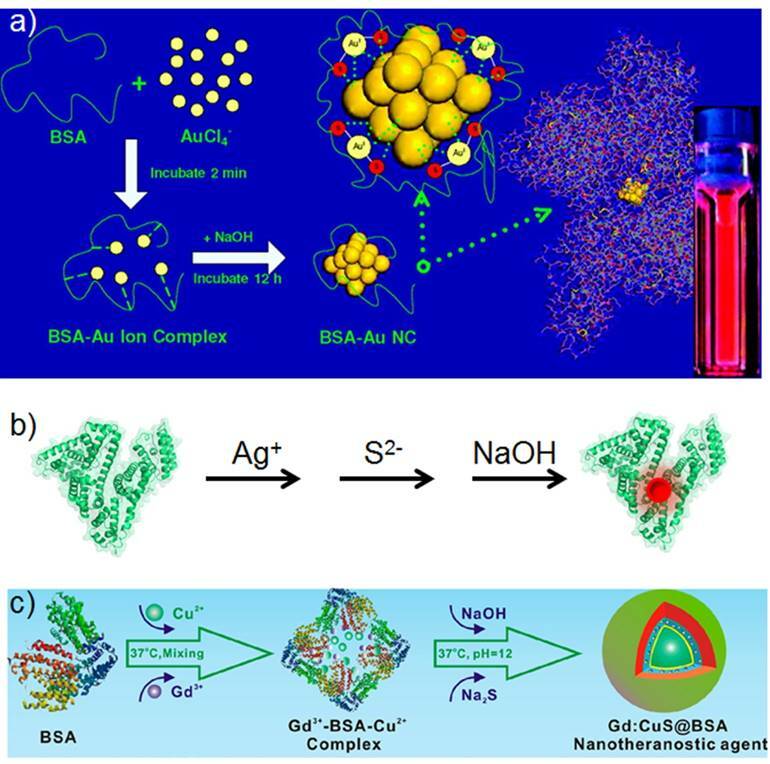 Cationic bimetallic Au-Ag luminescent nanoclusters were developed through postmodification of albumin with ethylenediamine . Fluorescent nanoclusters could be used to deliver the suicide gene in HeLa cancer cells, and they improved therapeutic outcomes when combined with 5-fluorocytosine. Albumin-templated gold nanocluster could be used as gatekeeper for mesoporous silica nanoparticles (MSNs) . MSN was loaded with two different anticancer drugs and capped with the albumin-templated gold nanocluster through electrostatic interaction. The prepared multifunctional nanoparticle possessed high drug-loading capacities and behaved with no premature leakage. Albumin-templated NIR fluorescent gold nanoclusters were also conjugated with folic acid (FA) and cisplatin prodrug as an integrated theranostic nanoplatform for targeted NIR fluorescence imaging and chemotherapy on 4T1 breast cancer . FA modification significantly improved the cellular uptake and cytotoxicity of the prepared nanoparticles in the 4T1 breast cancer cells. NIR fluorescence could be used for non-invasive in vivo optical bioimaging. In addition, the prepared nanoparticle showed significant inhibition on the growth and lung metastasis of orthotopic 4T1 breast tumors. Albumin-templated Ag nanocluster was discovered with strong singlet oxygen (1O2) generation capacity under light irradiation (≈1.26, Rose Bengal as a standard) and could be applied in photodynamic therapy (PDT) . The prepared Ag nanocluster exhibited higher 1O2 generation capacity than that of gold nanocluster and commonly available photosensitizers. The prepared Ag nanocluster was also highly biocompatible and fluorescent and could be used to track the cell uptake of the nanoparticle and kill cancer cells through generating 1O2. Cadmium ions could also be prepared into luminescent nanoclusters with albumin as the template . The prepared nanoclusters could be modified with a tumor-targeted ligand, such as hyaluronic acid (HA), for cancer cell-specific drug delivery. The free thiol groups in albumin could coordinate with metal ions and provide nucleation sites for the growth of QDs. Thus, fluorescent HgS QDs and Ag2S QDs were formed with addition of metal ions and sulphur ions sequentially [37, 65]. The resulted fluorescent QDs exhibit tuned emission from the first NIR window (700-900 nm) to the second NIR window (1100-1700 nm), which could be utilized for non-invasive in vivo fluorescence imaging with high contrast and penetration depth [66, 67]. The PL quantum yield of the synthesized HgS QDs (4%-5%) is slightly higher than that of the synthesized Ag2S QDs (0.75%-1.8%). The emission peak of the synthesized HgS QDs could be tuned from 685 nm to 800 nm by adjusting the ratio of the Hg (II) and sulphur ions. The synthesized HgS QDs could be used in selective Hg(II) and Cu(II) sensing based on Dexter energy transfer for Hg(II) and photoinduced electron transfer for Cu(II), respectively. The PL emission peaks of albumin-templated Ag2S QDs could be tuned from 660 nm to 840 nm and even 1,294 nm by adjusting the Ag:S ratio . Further conjugation with antibody on the surface of the albumin-templated Ag2S QDs results in a cancer cell-targeted imaging agent. Excellent non-invasive in vivo tumor-targeted imaging was demonstrated through intravenous injection of the synthesized Ag2S QDs into human glioblastoma tumor-bearing mice. An excellent deep tissue imaging with high spatial resolution could be obtained when the emission peak of the synthesized Ag2S QDs is tuned to 1,050-1,294 nm, because it locates within the second NIR window (1,000-1,700 nm) . To further overcome the intrinsic drawbacks of optical imaging, a complementary imaging modality should be integrated to yield a dual-modal nanoprobe. The designed fluorescence/MR dual-modal imaging nanoprobe was prepared by modifying the albumin-templated Ag2S QDs with DTPAGd . The obtained nanoprobe combined both high sensitivity of optical imaging and high spatial resolution and unlimited penetration depth of MRI, which might benefit tiny tumor diagnosis. Albumin could coordinate with metal ions and form QDs, but not all the formed inorganic nanoparticles are fluorescent. Some inorganic nanoparticles are non-fluorescent but possess other attractive properties for biomedical applications. The albumin-templated non-fluorescent inorganic nanoparticles might be used for MRI, photoacoustics, photothermal conversion, or their combinations . 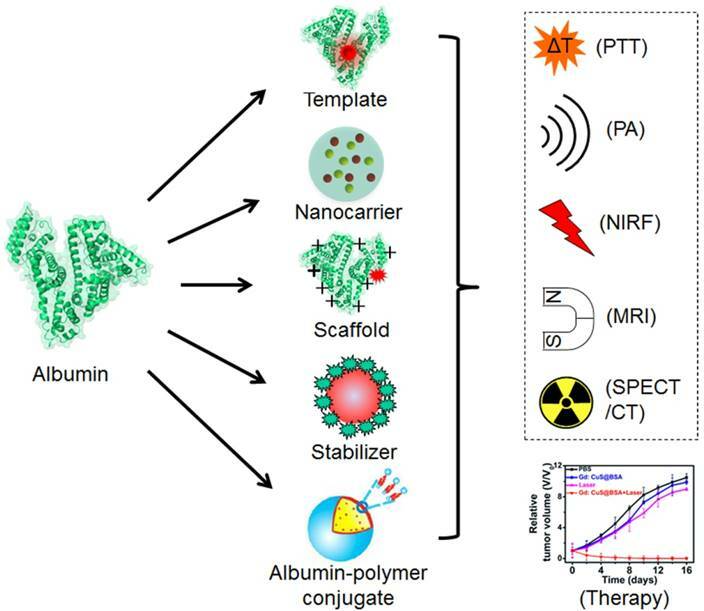 Further modifications on the surface of albumin could endow the nanoparticle with more functions and result in multifunctional nanoparticles for multi-modal imaging, combinational therapy and theranostics . The coordination with Gd ions could form an albumin-templated gadolinium oxide nanoparticle for MRI (Figure 3) . Modification with fluorescent, photoacoustic and photothermal convertible cyanine dyes resulted in a photothermal nanoagent guided by NIRF/photoacoustics/MRI triple-modal imaging modalities. Multifunctional nanotheranostic agent exhibits combined advantages of high sensitivity, precise localization and excellent spatial resolution, which synergistically benefit non-invasive precise tumor diagnosis and localization. The prepared nanotheranostic agent improves tumor accumulation and pH-responsive photothermal effect, which eliminates tumors effectively without regrowth. In addition to photothermal therapy (PTT), PDT could be integrated into the albumin-templated Gd nanoparticle through a noncovalent assembly . The resulting theranostic agent could be used for PDT guided by in vivo bimodal imaging with NIRF/MRI modalities. Scheme of preparing theranostic nanoparticles with BSA as template for trimodal NIRF/PA/MR imaging-guided photothermal tumor ablation. CuS nanoparticle is another thoroughly studied nanoparticle because of its strong absorption at the NIR wavelength, which could be advantageous in PTT . An albumin-templated CuS nanoparticle could be synthesized through a process similar to that of Ag2S QDs synthesis . Cu(II) ions were added into an aqueous albumin solution. Subsequently, albumin-templated CuS nanoparticle was formed with addition of sulphur ions. The prepared nanoparticle possessed good biocompatibility and showed satisfactory results in both in vitro and in vivo PTT. Further integration with Gd ions was achieved for PTT guided by dual-modal imaging with MRI/photoacoustic modalities . Cu(II) ions and Gd ions were introduced into the albumin solution simultaneously, and multifunctional nanoparticle was formed with addition of sulphur ions. Gd ions could also be integrated into the multifunctional nanoagent in the form of a Gd2O3 nanoparticle for such kind of PTT . The integrated nanotheranostics could be loaded with DOX for synergistic chemo-photothermal therapies. An albumin-templated CuS nanoparticle was also integrated with radionuclide (99mTc) and resulted in a multifunctional nanoagent for PTT guided by multimodal imaging with NIRF/SPECT/CT/photoacoustic modalities . The obtained nanoagent showed complementary advantages of multimodal imaging modalities, including highly sensitive NIRF, microscopic PA imaging and precise anatomic SPECT/CT imaging. This strategy could be used in other stoichiometric transitions of metal sulphide and metal chalcogenide nanocrystals. Chai and his collaborators synthesized an albumin-templated bismuth sulphide nanotheranostic agent with multiple advantages . The Bi2S3 NPs in the synthesized nanotheranostic agent presented strong absorption in the NIR wavelength and X-ray-triggered sensitisation effects, which could be used for combinational radio/photothermal therapies. Additional radiolabelling resulted in a multifunctional nanoplatform of combinational therapies guided by multimodal imaging with PA/SPECT/CT modalities. The in vivo safety of albumin has been demonstrated by its applications in clinical nanomedicine (Abraxane) and several clinical diagnosis agents (Table 1). Thus, the development of albumin-based nanoparticles for drug delivery and bioimaging could help guarantee the biocompatibility of obtained nanoparticles and benefit the clinical approval of such materials. The loaded active ingredients could be chemotherapeutic drugs, pulmonary drugs, inhibitors, dyes, contrast agents or their combinations (Figure 4) [75-80]. The prepared albumin-based nanoparticles could be used for chemotherapy, PTT, PDT, combinational therapy, optical imaging, MRI, photoacoustic tomography, multimodal imaging or theranostics [80-84]. 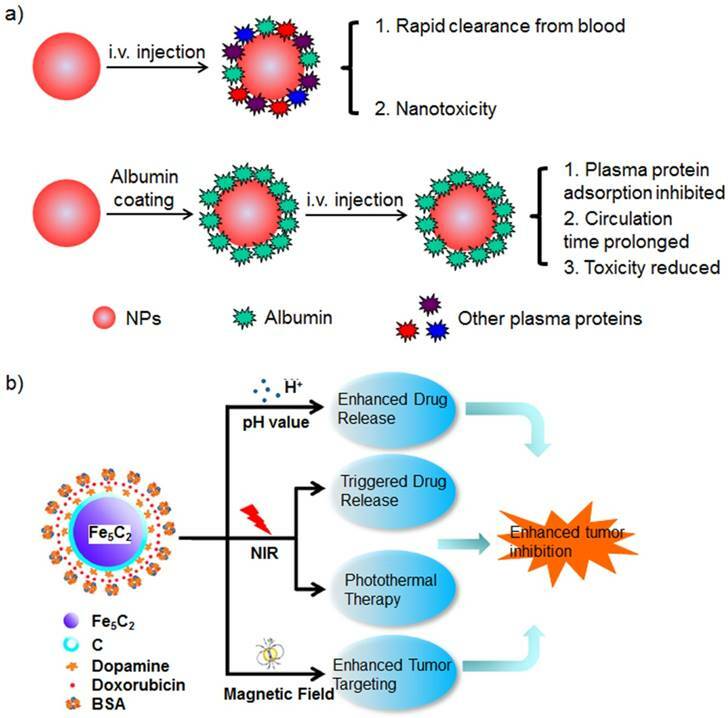 In comparison with small molecular drug formulations, albumin-based nanoparticles perform special functions, such as the efficient treatment of drug-resistant and orthotopic brain tumors [81, 85-87]. Systematic study on albumin-based nanomedicine shows not only tumor targeted drug delivery but also alleviated in vivo drug toxicity . The well-demonstrated in vivo drug toxicity alleviation of albumin-based nanomedicine provides the possibility of higher dosage administrated to patient but no higher side effects. A large amount of albumin-binding proteins (e.g. SPARC and gp60) are overexpressed in many tumors; however, further conjugation of targeted ligand to albumin-based nanoparticles could increase specific nanoparticle uptake into cancer cells [86, 89-92]. The utilized targeted ligands could be a nanobody, FA, peptide, glycyrrhetinic acid, antibody, mannose and TNF-related apoptosis-inducing ligand (TRAIL) [87, 92-98]. Dual modifications with a targeted peptide and cell-penetrating peptide could improve the tumor targeting and cell penetration of nanoparticles . Albumin is successfully applied as a nanocarrier in clinical nanomedicine (Abraxane). Compared with Taxol (a formulation of free paclitaxel), Abraxane shows a significantly longer time prior to tumor progression among patients of metastatic breast cancer. Nevertheless, the Abraxane formulation dissociates rapidly into the size of a single albumin upon administration, thereby preventing the optimization of its advantages in nanomedicine (e.g. enhanced permeability and retention (EPR) effect) . In order to improve the stability of the albumin nanoparticle, crosslinkers might be used during the fabrication of albumin-based nanomedicine with demonstrated ability of tumor targeting . 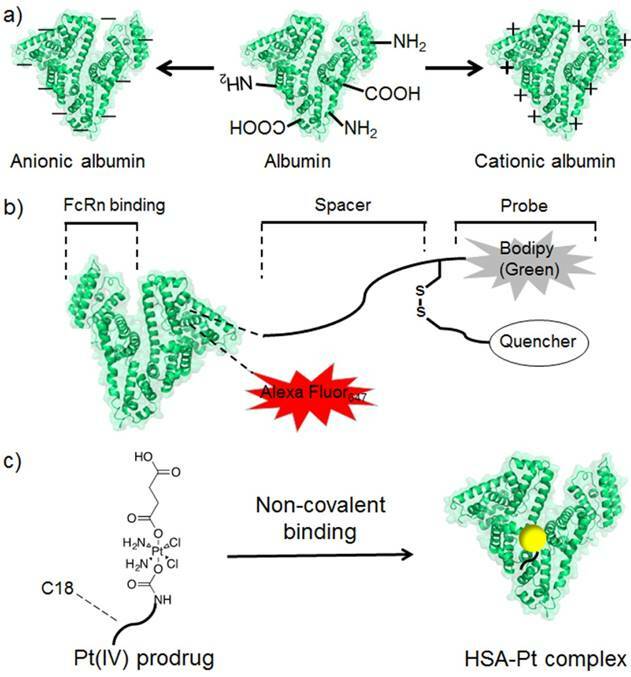 In order to further improve the active targeting to the tumor, targeting ligands could be modified on the surface of the albumin-based nanoparticle . Increased efficacy of albumin-based nanomedicine could be achieved by co-loading with different drugs for combinational therapy and contrast agents for integrated theranostics . To improve the efficacy of albumin-delivered paclitaxel, a multifunctional Abraxane-like nanodrug was formulated by simply mixing human serum albumin, paclitaxel and indocyanine green (ICG) together . In the prepared nanoparticle, albumin worked as a nanocarrier, paclitaxel was the chemotherapeutic agent and ICG was the NIRF imaging and PTT agents. The multifunctional nanodrug completely eliminated subcutaneous tumors and significantly treated mice with metastatic tumors. 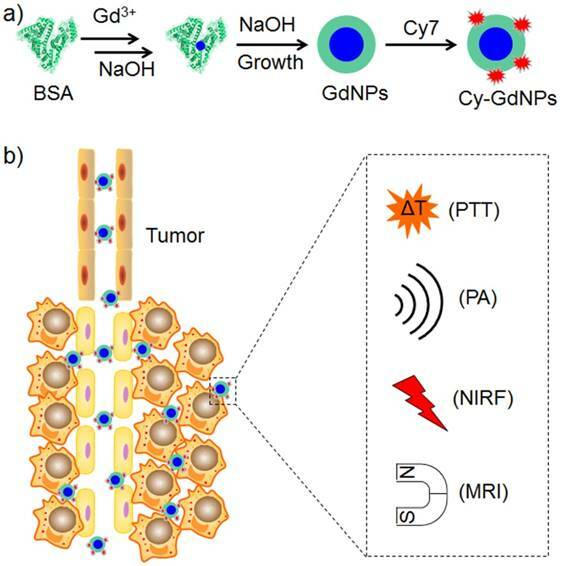 Further multifunctionalization has been achieved with co-delivery of a photosensitizer and paclitaxel for NIRF imaging/combinational therapies, chelation of Mn (II) ions for MRI and peptide conjugation for cancer cell targeting . Such a combined photodynamic/chemotherapy nanoplatform exhibits significantly improved therapeutic efficacy compared with that of monotherapies both in vitro and in vivo. The combinational application of albumin and catalase as the nanocarrier to deliver paclitaxel and photosensitizer benefits the decomposition of endogenous H2O2 to generate oxygen and thereby relieves tumor hypoxia . The relieved tumor hypoxia provided a large amount of oxygen for PDT and contributed to overcome the drug resistance of tumors. Thus, such hypoxia was helpful for clinical cancer therapy. Albumin-based nanoparticles could be loaded with other chemotherapeutic drugs and inhibitors for targeted drug delivery to reduce side effects [97, 104-109]. Co-loading of different chemotherapeutic drugs and inhibitors could benefit cancer treatment by combinational therapies [91, 102, 110]. A reasonable design could result in a stimulus-responsive drug delivery nanosystem, such as pH, redox and NIR light [110-112]. a) The schematic illustration of preparing albumin-based nanotheranostics with HSA, PTX and ICG. b) The schematic illustration of preparing ICG loaded albumin nanoparticles for NIRF guided synergistic phototherapy. Figure (b) adapted with permissions from . Proteins could be incorporated into albumin-based nanoparticles through desolvation . Most proteins are insoluble in organic solvents. Hence, proteins aggregate and form particles when a water-miscible organic solvent is added into aqueous protein solution . The cell-penetrating 30Kc19 protein and therapeutic betagalactosidase were successfully co-loaded into albumin-based nanoparticles, which overcome the poor cell penetration ability of betagalactosidase . The co-assembly of different functional proteins provided a strategy for efficient intracellular protein delivery and could be applied to other proteins. The o/w strategy also loaded the insulin into albumin-based nanoparticle . The presence of chitosan and albumin was essential to enhance the interactions between the nanoparticles and the intestinal cells and further increased insulin permeability. Such phenomenon offered a promising future for oral insulin delivery. Inorganic nanoparticles could be loaded into albumin-based nanoparticles for special applications. A gold nanorod and paclitaxel were co-loaded into an albumin-based nanoparticle, and they showed synergistic efficacy for cancer therapy . The gold nanorod was useful for PTT and NIR light-triggered drug release. MnO2 nanoparticles were also loaded into albumin-based nanoparticles . Moreover, MnO2 nanoparticles reduced tumor hypoxia, H2O2 concentration and acidity through local injection. When loaded into albumin-based nanoparticles, MnO2 nanoparticles could decrease hypoxia-inducible-factor-1alpha through systemic administration, thereby benefitting chemotherapy and overcoming hypoxia-related drug resistance. Given its ability to generate oxygen, the MnO2 nanoparticle could be co-loaded with a photosensitizer, which required oxygen to work and modulated tumor hypoxia for enhanced PDT and combinational therapy with a cis-platinum prodrug . Loading of organic selenocompounds (PSeD) in albumin-based nanoparticles with FA as the targeting ligand facilitated the generation of cancer cell-targeted ROS; consequently, the radiotherapy against cancer radioresistance was significantly improved . Albumin could be used to deliver oligonucleotides for gene transfection or gene therapy . Simple incorporation of albumin in traditional polyethylenimine-DNA polyplexes will significantly affect transfection efficiency . The dual-peptide modification with cancer cell-targeted arginine-glycine-aspartate and cell-penetrated HIV-1 transactivator of transduction sequence (Tat) improved gene transfection efficiency . Albumin nanoparticles loaded with both gold nanorods and small interfering RNA exhibited effectiveness in synergetic photothermal/gene therapies . Albumin is an endogenous protein excreted by the liver. It helps albumin-based nanoparticles avoid capture by the reticuloendothelial system and reduces fluorescence interferences from untargeted organs for imaging. In our previous study, we loaded a self-quenching-resistant hydrophobic dye into an albumin-based nanoparticle by hydrophobic interaction; we surprisingly observed lower fluorescence distribution in the liver and spleen compared with that in the tumor . Tang's group loaded aggregation-induced emission (AIE) dyes into an albumin-based nanoparticle and achieved good in vivo tumor fluorescence imaging [124, 125]. The AIE dye could be co-loaded with paclitaxel and polypyrrole (PPy) in albumin-based nanoparticles . The fluorescence of the AIE dye could guide PPy-based PTT, which synergised with paclitaxel-based chemotherapy. A reasonable binding of self-quenching dyes with albumin could also enhance fluorescence emission and benefit bioimaging . Our group found that the squaraine dye loaded into an albumin-based nanoparticle would result in absorption spectrum red-shift to the NIR range; this phenomenon quenched the fluorescence, but benefited the NIR photoacoustic tomography . A newly synthesized naphthalene-fused Bodipy dye showed strong absorption beyond 700 nm wavelength and was a stable contrast agent for in vivo photoacoustic tomography . Loading with pH-responsive dye could be used for intracellular pH mapping . When the absorption peak of the loaded pH responsive dye was located in the NIR range, the dye could be used in real-time in vivo tumor pH sensing with non-invasive photoacoustic imaging . Co-loading of pH-sensitive and pH-inert NIR dyes helped establish a ratiometric photoacoustic imaging pair that was useful for quantitative in vivo tumor pH detection and effective PTT for large tumors . The delivery of photosensitizers and/or NIR dyes can result in a nanotheranostic platform for NIRF-guided phototherapy [99, 132, 133]. ICG-loaded albumin nanoparticles improved ICG accumulation at tumor for tumor-targeted photothermal/photodynamic dual therapies with the guiding of NIRF/photoacoustic imaging modalities. Synergetic PTT/PDT suppressed tumor growth and recurrence completely. Albumin nanoparticle loaded with NIR dye could be labelled with Gd ions for complementary MRI/NIRF imaging guided PTT; consequently, the lymphatic metastasis of cancer post surgery was effectively inhibited . 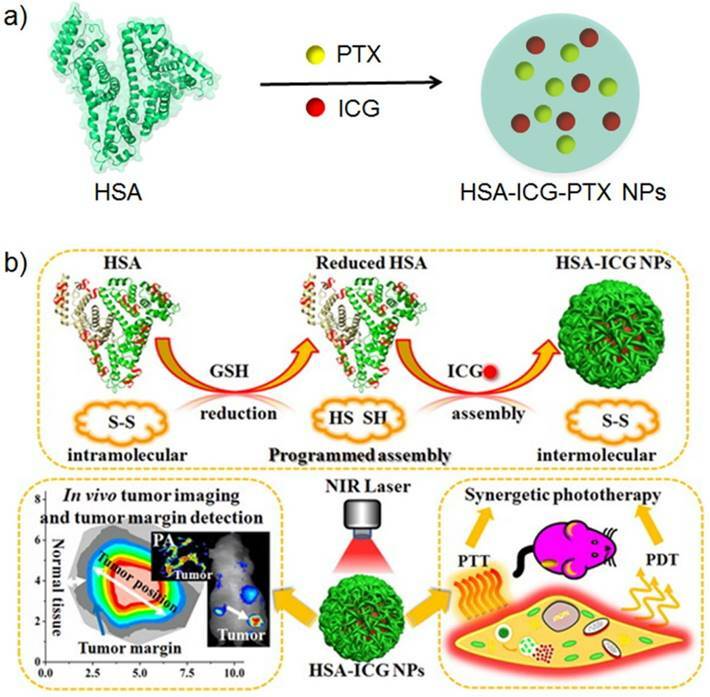 Photosensitizers could be loaded into albumin-based nanoparticles through intermolecular disulphide bond reconstruction and hydrophobic interaction, which both exhibited excellent redox response and enhanced tumor targeting . Mild hyperthermia helped improve ROS generation for promoting PDT. The intrinsic fluorescence and photoacoustic properties of photosensitizers, combined with the chelating characteristic of porphyrin rings, resulted in triple-modal imaging functions of NIRF, MRI and photoacoustic tomography. Upon application of low-energy NIR light irradiation, tumors became completely suppressed, and no tumor recurrence was observed. The loading of mitochondria-targeted photosensitizers in albumin-based nanoparticles improved ROS generation considerably, which lead to mitochondrial disruption and cell apoptosis . Compared with albumin-based nanoparticles loaded with non-mitochondria-targeted photosensitizers, the nanoparticles loaded with mitochondria-targeted photosensitizers demonstrated a higher phototoxicity against cancer cells and significantly higher tumor growth suppression. Co-loading of photosensitizers and NIR dyes could form a FRET pair that transferred excited energy from the photosensitizers to the NIR dyes . The fluorescence and ROS generation ability of photosensitizers did not recover until NIR light irradiation. The switchable PDT agent significantly suppressed tumor growth through photodynamic/photothermal synergistic therapies and reduced skin response, whereas traditional photosensitizers aroused severe skin erythema and oedema. Numerous nanoassemblies of albumin have been explored as nanocarriers for targeted drug delivery and bioimaging. As a natural biomacromolecule measuring 6.67 ± 0.57 nm, albumin also exhibits possible EPR effect on tumors (controversial); a larger size displays excellent EPR effect [138-140]. In addition, a single albumin possesses long blood circulation and high biocompatibility, which facilitate the maintenance of high blood drug concentration for long periods [16, 141]. Thus, a single albumin could be used as a scaffold to be functionalized for effective drug delivery and bioimaging . Drugs and/or dyes are loaded into a single albumin in a number of ways, including covalent conjugation and noncovalent interaction [138, 143]. Albumin could be modified with drugs, dyes, targeting ligands, charged functional groups, oligonucleotides or their combinations (Figure 5) [143-148]. Albumin comprises free carboxyl and amine groups, both of which could be utilized for covalent modification . In general, albumin shows a negative zeta potential at the pH of human blood and cannot bind with oligonucleotides by electrostatic interaction. When the carboxyl groups of albumin were modified with cationic groups, cationic albumin was formed and served as a non-viral DNA carrier for plasmid DNA binding and delivery . While, negative albumin could also be obtained with surface modification with anionic groups. Cationic albumin tends to be distributed at the lungs; thus, its property is successfully applied for the delivery of therapeutic siRNA to treat lung metastatic cancer . A single albumin could be modified with siRNA and used to deliver matched IGF-I-receptor siRNA sequence . In vitro imaging of microvessels from mice treated with designed albumin-siRNA conjugate demonstrated efficient extravasation and cellular uptake in capillary endothelial cells, cardiomyocytes and vascular smooth muscles. A monodispersed albumin nanoconjugate with a 13 nm diameter was also synthesized through surface modification with 15 oligonucleotides and 15 targeting ligands . The prepared nanoparticle exhibited 61-fold enhancement in the targeted cellular delivery of oligonucleotides compared with the non-targeted control nanoconjugate. Low nanomolar concentrations demonstrated significant activity enhancement of the oligonucleotide, and no cytotoxicity was observed. Owing to its small size, the designed nanoparticle penetrated deeply into the 3D tumor spheroids, whereas nanoparticles with sizes of over 300 nm could not. To improve the in vivo blood circulation of cationic albumin, the antisense oligonucleotide-bound cationic albumin was incorporated into lipid nanoparticles; the cationic albumin performed as an effective antisense oligonucleotide vehicle for tumor-targeted delivery and in vivo therapy . The abundant amine and carboxyl groups in albumin could be modified so as to endow albumin with functional groups for click chemistry. Click chemistry groups can be efficiently conjugated with poly(amido amine) structures, which resulted in a dendrimer with albumin as the core . The resulting dendrimer showed a significantly higher loading ability with DOX compared with that of native protein because of the availability of binding pockets in the albumin core and dendritic shell. The modification with D-alfa-tocopheryl polyethylene glycol succinate, which could serve as an inhibitor of P-glycoprotein, can overcome multidrug resistance (MDR) efficiently . The abundant amine groups in albumin could be modified with carboxyl-group-bearing small molecules through EDC/NHS catalysis. NIR cyanine dyes could be modified on albumin in this manner . The resulting nanoconjugate showed considerably higher accumulation at tumors compared with those of free cyanine dyes. Given its NIR absorption and emission abilities, the synthesized nanoconjugate could be used for tumor-targeted PTT guided by NIRF/photoacoustic tomography. a) The scheme of modifying albumin into differently charged derivatives for further applications. b) A bioprobe synthesized with albumin as the scaffold. The redox responsive fluorescence pair of dye and its quencher was linked through a disulphide bond. c) The scheme of albumin bound with cisplatin prodrug. Albumin possesses a long circulation half-life and helps maintain high blood concentration for long periods . This property could be used for designing efficient drug delivery systems by improving the AUC. An albumin-drug conjugate was designed by covalent conjugation through a tumor-targeting and internalization module . Drug conjugation with albumin increased the serum half-life from 11 min to 17.4 h, thereby indicating an increase of more than 22-fold in the AUC. DOX has been used for cancer therapy, but its cardiotoxicity hinders its utilization in clinical applications . Therefore, a beta-glucuronidase-responsive DOX prodrug was designed by covalent conjugation with albumin . The designed albumin-binding prodrug could deliver DOX to the tumor site selectively, inhibit tumor growth and avoid the side effects induced by the free drug. A caspase-3-responsive DOX prodrug was also successfully modified on albumin . Under radiation-induced apoptosis, caspase-3-responsive linker between Dox and albumin was cleaved, and the DOX was released. The combination of radiotherapy and caspase-3-responsive DOX prodrug prolonged the half-life of DOX with enhanced tumor accumulation and improved drug activation at the tumor locally. Owing to the negative zeta potential of albumin, its cellular uptake is not always satisfactory for designing an albumin-based drug delivery system. Thus, cell-penetrating peptide was conjugated to albumin and achieved a significantly enhanced intracellular delivery and tumor penetration of the albumin . The designed conjugate exhibited effective anti-tumor efficacy in both in vitro cultured cells and in vivo tumor-bearing mice. Photosensitizers could also be conjugated to albumin through a pH-cleavable bond, which resulted in a pH-responsive nanotheranostic agent . The long circulation time of albumin is attributed to the effective recycling mediated by the Fc receptor (FcRn), which is expressed in endothelial cells and organs, including the kidneys, liver and intestine. Binding to FcRn during recycling protects albumin from degradation in the endosomes and lysosomes. The FcRn-mediated recycling-dependent process could be used for designing albumin-based prodrugs. However, premature bioreduction processes involved in FcRn trafficking might result in a shortened circulation time, which inspired scientists to study the process for optimizing the drug delivery system. Albumin was labelled with a green Bodipy dye and further conjugated with a quencher through a disulphide bond . Bioreduction could cleave the disulphide bond and remove the quencher, which lead to a seven-fold increase in the fluorescence intensity of Bodipy. Intracellular confocal fluorescence imaging revealed that FcRn-mediated recycling pathway was not suitable for bio-reduction. The conjugate that was composed of albumin and TRAIL through a poly(ethyleneglycol) (PEG) chain preserved the bioactivity of TRAIL (apoptosis, cytotoxicity, antiproliferation and targeting of rheumatoid arthritis) and improved the in vivo lifespan of TRAIL . Compared with TRAIL, the albumin-TRAIL conjugate exhibited better pharmacokinetic profiles and efficacy to treat rheumatoid arthritis. To improve its tumor-targeted delivery, the NO-releasing prodrug was conjugated with albumin dimer and found as an efficient augment for the EPR effect with cell death . The same prodrug was efficient in treating mice with multidrug-resistant tumors . The EPR effect was augmented by the S-nitrosated albumin dimer; therefore, the S-nitrosated albumin dimer and macromolecular anti-tumor drugs (e.g. micelles and liposomes) were intravenously injected into the tumor-bearing mice together . In vivo imaging with fluorescent micelles revealed enhanced fluorescence intensity in the mice injected with both S-nitrosated albumin dimer and micelles compared with that in the mice injected with only micelles. In the mice bearing C26 tumors, the S-nitrosated albumin dimer increased drug accumulation at the tumor by 3-4 times. In the tumor model with low permeable vasculature, the tumor accumulation of Doxil showed a six-fold increase in the presence of S-nitrosated albumin dimer. Albumin comprises hydrophobic pockets that facilitate its binding to hydrophobic or amphiphilic small molecules for effective delivery [165-168]. The binding between albumin and drugs/peptides could be achieved by direct interaction between albumin and drugs/peptide or interaction between albumin and prodrugs/peptide-conjugate. The albumin and drugs/peptide could bind together when there are strong interactions between them . However, most drugs/peptide are unable to interact with albumin strongly, in which case the drugs/peptide could be conjugated with albumin-bound component [150, 170, 171]. The resulted prodrug/peptide-conjugate could form stable nanocomplex with albumin. The nanocomplex formed through noncovalent binding could achieve excellent stability in a body fluid environment, which benefits its applications in the complicated in vivo environment . The nanocomplex of ICG-bound albumin radiocolloids was prepared through noncovalent binding and used for lymphoscintigraphy with triple-modal NIRF/SPECT/X-CT imaging intraoperative guidance. Unlike ICG alone, the bound ICG exhibited identical dynamics with radioactive components and improved the fluorescent signal-to-noise ratio by 86%. To obtain noncovalent nanocomplex with targeted ability, a peptide-conjugated IR783 was applied in binding with albumin to form noncovalently targeted bionanoparticles . The prepared bionanoparticles were stable in vitro and in the lymphatic system in vivo. They can be further used in targeted sentinel lymph node procedures, which did not suit the clinically approved 99mTc-Albumin. Binding with albumin could considerably prolong the blood circulation time of small molecules. Thus, the conjugate of NIR cyanine dye and tumor-targeted ligand was bound to albumin through noncovalent interaction . In vivo study demonstrated that the presence of albumin could enhance the biological half-life of the probe and help a large amount of the probe to reach the target site; these changes enabled the NIRF imaging of subcutaneous tumors for several days. Cisplatin cannot effectively bind to albumin by non-covalent interaction. Therefore, a series of cisplatin prodrugs with axial ligands was designed to mimic the binding ability of fatty acids . Cisplatin could be released from prodrugs by intracellular reduction with the loss of axial ligands. Aliphatic tails with different lengths exhibited varied cellular uptakes and cytotoxicities. The cisplatin prodrug with hexadecyl chain was the most potent among the synthesized prodrugs. Computation showed that prodrug was buried inside albumin, which helped preserve its stability in the human blood. To improve the tumor-targeted drug delivery, a fatty acid-modified drug was loaded into the albumin and HER2-binding affibody fusion proteins . In vitro experiments demonstrated a specific cell uptake by the HER2 positive cells, which indicated a potential ability to perform in vivo tumor-targeted drug delivery. In addition to the cisplatin prodrug, anticancer copper (II) prodrugs could be bound to the hydrophobic cavity in albumin . In vitro experiments demonstrated the enhanced cytotoxicity in MCF-7 cells in comparison with free copper (II) compounds, but normal cells showed no increased cytotoxicity. Another copper compound bound to the HSA through His242 binding could be released under the stimulus of pH . This compound achieved better selectivity and ability to inhibit tumor growth compared with the free copper compound alone in vivo. Ferric anticancer agents were also reported to bind to albumin and inhibit tumor growth in vivo . Three anti-tumor drugs, namely, 5-fluorouracil, a copper (II)-based anti-tumor agent and a gene agent, were co-loaded in albumin by hydrophobic interaction or covalent conjugation . The triple-drug combinatorial drug delivery system exhibited enhanced targeting ability and inhibition of liver tumor growth and showed few side effects. The Evans blue (EB) derivative displayed strong binding ability with albumin; thus, EB-conjugated peptide could be loaded in albumin via mixing . Given the long in vivo half-life of albumin, the conjugated peptide could remain in vivo for several days. The strategy is useful in developing long-acting therapeutics. Another conjugate composed of the EB derivative, tumor-targeted peptide and chelator was synthesized and bound to albumin . The chelater could bind to Cu-64 for tumor-targeted PET imaging or to therapeutic isotopes for tumor-targeted radiotherapy. Many nanoparticles would bind to the albumin and form protein corona after being injected into the blood. The protein corona affects the nanoparticles' biocompatibility, biodistribution, cell uptake and intracellular degradation (Figure 6) [29, 179]. The protein adsorption post-injection cannot be controlled, and the nanoparticle maintaining designed properties cannot be ascertained. Furthermore, many nanoparticles fail to disperse in aqueous solutions without stabilizers. They are prepared with the assistance of stabilizers or added with stabilizers prior to dispersion in aqueous biological environments. Many stabilizers are also used to disperse nanoparticles in water. On the basis of the high biocompatibility and long blood circulation half-life of albumin, many studies have been devoted to the development of albumin-stabilized nanoparticles for biomedical applications [180-185]. Albumin could be introduced during nanoparticle synthesis or via stabilizer replacement [186-188]. A reasonable design could result in stimulus (e.g. pH, enzyme and DTT)- responsive hybrid nanoparticles [189-193]. These prepared nanoparticles could be used for drug delivery, bioimaging or theranostics [190, 194-199]. Many nanoparticles possess poor stability in biological solution and show poor pharmacodynamics (PD) and pharmacokinetics (PK). These poor performances result in inefficient drug delivery. In order to improve the drug delivery efficiency with these nanoparticles, it is necessary to stabilize these nanoparticles with additional materials . Albumin is well known for its biocompatibility and stealthy property from reticuloendothelial system, thus, several studies have explored its applications in stabilizing drug nanocarriers for efficient drug delivery [123, 202]. Albumin-stabilized cationic gelatin (C-gel) nanoparticle could be loaded with DOX/DNA intercalation complex . The prepared nanoparticle was responsive to pH and tumor-specific matrix metalloproteinases (MMPs). When the C-gel was digested by the MMPs, the loaded DOX/DNA intercalation was released and further digested by deoxyribonucleases to release DOX completely. In vivo experiments demonstrated that the designed drug delivery system with significantly low cardiotoxicity was more powerful than free DOX in terms of cancer treatment. Albumin could be used to stabilize gold nanoparticles (nanorod and nanostar) [202, 203]. Loading the nanoparticle with rifampicin to enhance the antitumor drug accumulation in the MDR cancer cells resulted in improved PTT with decreased toxicity . As a result of the X-ray attenuation property of gold and the SERS property of gold nanoparticles, the NIR light-adsorbed gold nanostar could be used for PTT guided by photoacoustic tomography/X-CT/SERS . MoS2 nanoparticles denote another set of inorganic nanoparticles that show strong absorption at the NIR wavelength, and they were also used for PTT . MoS2 nanoparticles stabilized with albumin could be loaded with Dox, and the resulting nanoparticle was effective for chemophotothermal synergistic therapy . In the o/w emulsion method in preparing drug-loaded nanoparticles, albumin could be used to stabilize the oil droplet at the organic/aqueous interface . The organic phase could be removed by evaporation to achieve an oil-free nanoscale delivery system. The albumin stabilized on the surface of the PEI/nucleic acid complex could be detached under the intracellular pH stimulus; this condition exposed the positive charge of PEI and facilitated the escape from the lysosomes for efficient gene transfection or silencing [208, 209]. The albumin has been demonstrated to be a good stabilizer at the interface between water and perfluorocarbon. The resulted nanoparticles showed significant increase in singlet oxygen generation with the loaded photosensitizer due to the excellent oxygen capacity of perfluorocarbon . a) Schematic of the effects of albumin corona on the nanoparticles in vivo. Various plasma proteins are adsorbed onto the nanoparticles after they are injected into the blood; the albumin corona around the nanoparticle inhibits the adsorption of plasma proteins. b) The scheme of albumin-stabilized magnetic nanoparticle and its multifunctional applications in biomedicine. Figure (b) adapted with permission from . Albumin-stabilized nanoparticles could be used for targeted bioimaging both in vitro and in vivo [198, 211, 212]. Multimodal probes have been widely studied to utilize the advantages of different imaging modalities. Given the abundant functional groups in albumin, different molecules could be modified into albumin-stabilized nanoprobes, which integrate different imaging modalities. NIR dyes and folate were modified on an albumin-stabilized magnetic nanoparticle, and the prepared hybrid nanoparticle exhibited active tumor targeting for MRI/NIR dual-modal imaging in vivo . Albumin-stabilized gadolinium nanoparticles could be iodinated and used as MRI/X-CT dual-modal probe for osteosarcoma imaging in vivo . DTPA-coupled BSA with Gd (III) ion chelation could be used to stabilize QDs, which could be utilized for MRI/optical dual-modal bioimaging . In comparison with Gd3+-ion-doped upconversion nanoparticles (UCNPs), the UCNPs stabilized with Gd3+-ion labelled albumin showed a stronger MRI effect . This can be attributed to the efficient approaching and exchange of Gd3+ with the surrounding water protons. This significant finding could be used to guide the design of future highly effective MRI contrast agents. MnO nanoparticles were used as MRI contrast for tumor imaging . Their albumin coating improved their stability in aqueous solutions and provided benefits for their modification with Cu-64 as MRI/PET dual-modal imaging agents for PET imaging . Albumin-capped Mn3O4 nanoparticles could be used for MRI but also demonstrated to degrade with the artificially introduced ascorbic acid . The effective degradation of the inorganic nanoparticles greatly guarantees the in vivo safety of the designed nanoparticles. Fluorescent molecule-labelled albumin could be used to stabilize CoFe2O4 magnetic nanoparticles for MRI/optical dual-modal bioimaging . Hypoxia is regarded as a key feature of the tumor microenvironment that significantly influences tumor treatment response. An albumin-stabilized gold nanoparticle was synthesized for tumor hypoxia imaging in vivo (Figure 7a) . The nanoparticle was modified with hypoxia-sensitive nitroimidazole moiety, which was converted into amine groups in the presence of nitroreductase. Conversion from the nitro group of nitroimidazole to the amino group helped increase the zeta potential of the prepared nanoparticle, which thereby improved cell internalization for accumulation at the tumor in vivo. The designed nanoparticle displayed enhanced X-CT imaging for tumor hypoxia in vivo. Albumin-stabilized nanoparticles could be used as nanocarriers for both drug delivery and contrast agent delivery or be directly applied in bioimaging . Thus, the designed hybrid nanoparticle could be used for both imaging and therapy [224, 225]. a) Preparation of Au@BSA-NHA for in vivo imaging of tumor hypoxia. b) Preparation of albumin/Ce6 stabilized EB/carbon nanotube-based delivery system (ACEC). Albumin-stabilized iron oxide nanoparticles could be used as a drug delivery vehicle for DOX . The hybrid nanoparticle exhibited efficient tumor MRI imaging with iron oxide nanoparticle and significant tumor growth inhibition with the released DOX. Magnetic nanoparticles are useful for MRI, and they exhibit the magnetic field-driven accumulation of nanoparticles at tumors . Albumin-stabilized Fe5C2 nanoparticles showed DOX release under NIR light irradiation or acidic condition. The combination of DOX therapy and NIR light induced PTT that inhibited synergistic tumor growth. Further application of a magnet at the tumor site improved nanoparticle accumulation at the tumor, which was monitored with the intrinsic MRI ability of Fe5C2 nanoparticles. Prussian blue nanoparticles have been widely explored MRI contrast agents, which could be stabilized with albumin and loaded with ICG . The obtained nanoparticle could utilize Prussian blue for MRI and ICG for NIRF-imaging/phototherapy. The resulting MRI/NIRF-guided phototherapeutic nanoparticle exhibited significant tumor growth inhibition in vivo without tumor recurrence . An albumin-stabilized MnO2 nanoparticle was prepared with the ability of MnO2 nanoparticles to regulate tumor hypoxia and respond to acidic pH and increased H2O2 . The prepared nanoparticle generated oxygen in the presence of H2O2 produced by cancer cells both in vitro and in vivo, as monitored with photoacoustic tomography. In addition, the nanoparticle increased the intratumoral pH from 6.7 to 7.2, as indicated by the data obtained from breast tumor model mice. Tumor treatment with the prepared nanoparticle shows significant down-regulations of hypoxia-inducible factor-1 alpha and vascular endothelial growth factor, which are critical regulators in tumor progression and aggressiveness. A further combination with radiotherapy, which is generally restricted by tumor hypoxia, showed significantly synergistic enhancement in the treatment of cancer in comparison with the use of radiotherapy alone. Owing to the intrinsic abilities of MRI and up-converting fluorescence emission, albumin-modified upconversion nanoparticles were prepared and loaded with NIR dye and a photosensitizer . In the designed nanoparticle, the upconversion nanoparticles could be used for MRI and in the transfer of the 980 nm excitation light to the photosensitizer for PDT. The NIR dye was used for NIRF optical imaging and PTT. The photothermal and photodynamic combinational therapies guided by multimodal imaging exhibited remarkably better effects on tumor growth inhibition in vivo compared with those of any therapy alone. Albumin is an efficient stabilizer for PPy nanoparticles . Further conjugation with a photosensitizer and chelation with Gd (III) ions resulted in multifunctional theranostics . The obtained nanoparticle could be used for photothermal/photodynamic combinational therapies guided by MRI/NIRF/thermal imaging. Albumin-stabilized carbon nanotubes could be loaded with photosensitizers for photodynamic/photothermal combinational therapies guided by NIRF/photoacoustic tomography (Figure 7b) . Bismuth selenide nanoparticles have been recently developed and used in NIR PTT guided by X-CT/photoacoustic tomography . The albumin-stabilized bismuth selenide nanoparticle could be loaded with DOX for in vivo thermo-chemotherapy guided by X-CT/thermal imaging . Another newly developed NIR-adsorbed inorganic nanoparticle, the WSe2 nanoparticle, could be stabilized with albumin and loaded with photosensitizers . The obtained multifunctional nanoparticle was successfully applied in synergistic PDT/PTT. Albumin-stabilized branched gold nanostructure could also be used for X-CT guided PTT on cancer . DOX-loaded mesoporous silica nanoparticles could be modified with Gd-chelated albumin through a disulphide bond . The designed nanoparticle showed potential in MRI and efficient intracellular redox responsive drug release. Further conjugation with HA improved its targeting ability for tumor-specific drug delivery. The mesoporous silica nanorod could be loaded with both a photosensitizer and a chemotherapeutic drug and further stabilized with albumin on the surface via a singlet oxygen cleaved linker . The photosensitizer in the designed nanoparticle was useful for NIRF imaging and guiding PDT for synergy with chemotherapy. Albumin offers many advantages when applied in biomedicine. However, different drugs are compatible with different materials. Albumin can be loaded with limited drugs [236, 237]. To utilize the complementary advantages of both albumin and other materials, albumin-polymer conjugates have intensely been studied for biomedical application during the past years [238-241]. Albumin-polymer conjugates could be synthesized classic NHS ester reaction with free amine groups in albumin, maleimide reaction with the free thiol groups in albumin or supramolecular interaction (Figure 8) [242-244]. The resulted albumin-polymer exhibits attractive properties that albumin itself does not have, such as penetration across blood-brain barrier (BBB), oligonucleotides delivery, and compatibility with more materials [238, 239, 245, 246]. These improved properties not only utilize the advantages of albumin but also widen its applications. Albumin alone cannot bind with oligonucleotides, but its conjugation with positively charged polymers could be loaded with oligonucleotides for effective gene transfection . The albumin in the albumin-polymer conjugation could chelate with Gd (III) ions and be used for MRI . The further loading of albumin with pDNA resulted in a theranostic nanosystem for MRI and gene transfection. Albumin alone cannot bind with protein for protein therapy. Thus, albumin-polymer-based nanoparticles show promise for protein loading and delivery [241, 248]. An albumin-dextran conjugate could be loaded well with DOX via assembly and subsequent heat treatment . This nanoparticle showed a hydrodynamic radius of ~90 nm, thereby making it useful for tumor-targeted drug delivery through the EPR effect. In vivo experiments demonstrated effective tumor growth inhibition with the intravenous injection of the prepared nanoparticles. 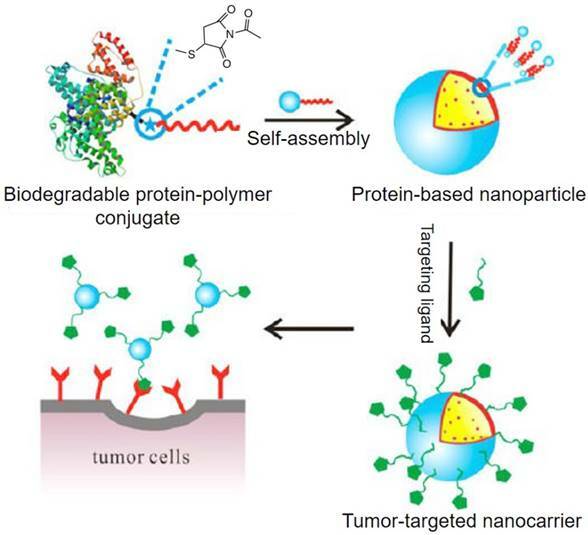 The formed nanoparticle assembled from an amphiphilic albumin-polymer conjugate could be modified with a targeted ligand to enhance its active targeting to cancer cells . A FA-modified albumin-dextran conjugate could be loaded with both DOX and Fe3O4 nanoparticles for effective use in targeted drug delivery systems with MRI diagnosis . Polysaccharides could also be used for conjugation with albumin to form nanoparticles for drug delivery . The current albumin-based nanocarrier showed limited Dox loading capacity; thus, the DOX was conjugated with albumin-PEG through an acid cleavable hydrazone linker to form a nanoparticle with an average diameter of ~100 nm . The prepared nanoparticle exhibited high DOX loading capacity compared with that of albumin alone. The DOX was released from the nanoparticle with a two-step drug release mechanism based on pH and protease responses. The drug could also be loaded in the albumin-polymer-based nanoparticle through a cleavable disulphide bond . Albumin could be modified with PEG and targeted ligands on the other end of the modified PEG . The formed conjugate could be loaded with hydrophobic dyes and used for cancer cell-targeted imaging. The scheme of synthesizing albumin-polymer-based nanoparticles. Figure adapted with permission from . The schematic modification of albumin. a) The modification on the sites of lysine residues. b) The modification on the sites of cysteine residues. The albumin-PCL conjugate could be used to stabilize upconversion nanoparticles for loading with both photosensitizers and DOX . The prepared nanoparticle could be used for upconversion imaging-guided PDT synergised with chemotherapy. Graphene oxide could be stabilized with a folate-albumin-photosensitizer conjugate to form a nanocomplex . The prepared nanoparticle was effective in image-guided synergistic cancer treatment with PDT/PTT. There are many advantages of albumin-based nanoparticles to facilitate their clinical applications and the success of Abraxane is the most excellent example. Encouraged by the success of Abraxane, numerous studies have explored various albumin-based nanoparticles and their applications in various areas, including drug delivery, bioimaging and theranostics. There are numerous reports using both HSA and BSA for constructing multifunctional nanomedicine. BSA have been used for in vitro diagnosis (ELISAs, immunoblots and immunohistochemistry), however, HSA is still preferable for the in vivo applications. BSA is an exogenous macromolecule and has been discovered as a potential immunogenicity to cause human allergy . While, HSA is an endogenous protein to human and has been clinically used for intravenous injection with demonstrated safety. The limited global yield of HSA has been the restriction to its clinical application. A promising solution to this problem is developing recombinant human serum albumin (rHSA) to produce biocompatible albumin to replace the HSA that is extracted from human blood. Most nanomedicine are designed to improve drug efficacy by enhancing targeted drug delivery and comparing the treatment outcome with free drug at a same dosage [5, 258, 259]. The increases of the safety and maximum tolerated dose (MTD) have been well demonstrated in Abraxane and guaranteed its clinical success . Considering the in vivo drug toxicity alleviation of albumin-based pharmaceutical nano-formulation, a possible opportunity to improve the treatment outcome in patients would be higher clinical dosage administration, which is generally restricted by the serious side effects of free drugs . During the synthesis of such nanostructures, albumin could be used as a template, nanocarrier, scaffold, stabilizer and albumin-polymer conjugate. Covalent conjugation and noncovalent assembly exist among these strategies. The success of Abraxane indicated the preference for a noncovalent assembly because it exerts no effect on the chemical entity of albumin; consequently, advantages of albumin are preserved, and the FDA requirement for a definite chemical structure is satisfied. The functionalization of the albumin-based nanoparticles is highly required to endow the nanoparticles with targeting ability, multifunctions, controlled drug release, which generally involves with bioconjugate chemistry. There are amine and sulfhydryl groups in the albumin that could be used for HSA modification . However, there are as many as 57 lysine residues and 35 cysteine residues in albumin, which indicate 57 amine groups and 35 sulfhydryl groups as potential modification sites. The uncertain modification sites and uncertain modification number on albumin will result a mixture of functionalized albumin (Figure 9). The production of functionalized albumin will vary batch to batch . These problems have been well recognized as an important factor in the quality control of protein-based drugs [262, 263]. Inspired by the vast commercial value of antibody-drug-conjugates (ADCs), intense efforts have been made on the site-selective modification of antibody . Though vast commercial value for albumin, the study of site-selective modification of albumin is still rare. We believe that the accumulated knowledge in the site-selective antibody modification will prompt the development of site-selective albumin modification and give functionalized albumin nanomedicine with higher reliable quality. On the other hand, only a few studies have focused on the preparation technology of albumin-based nanoparticles with large scale, uniform diameter distribution and stable diameter distribution in each batch. It is well studied that the size and shape could seriously affect the cell uptake and in vivo biodistribution of nanoparticle [265-267]. The development of reliable technologies with controlled manufacturing quality is critical to guarantee the clinical success of albumin-based nanomedicine and definitely accelerate the clinical translation of albumin-based nanoparticles. This work was supported by the National Basic Research Program of China (973 Program) (2013CB933500), the Key Program of the National Natural Science Foundation of China (Grant No. 51533005), the Major Research Plan of the National Natural Science Foundation of China (Grant No. 91333208), and Collaborative Innovation Center of Suzhou Nano Science and Technology, the Priority Academic Program Development of Jiangsu Higher Education Institutions (PAPD), the 111 Project and Qing Lan Project.